The "leave it" command is used to prevent your dog from picking things up. It allows you to tell your dog not to touch things that you don't want it to have, like a child's toy or a dirty tissue or any one of the hundreds of things dogs try to pick up and chew. It can also keep your dog from eating something that might be harmful. Fortunately, this important command is fairly easy to teach. Most dogs can be trained to "leave" even the most desirable of things behind. All you need to train your dog "leave it" is a handful of bite-sized treats and a quiet area. If you are clicker training, you will also need your clicker. Don't worry about this taking too much time either. Training sessions should be kept short and upbeat; about 5 minutes per session is enough. If your training sessions go on for too long, your dog may become frustrated and start making mistakes. To start, take one of the treats in your hand and allow your dog to see it. As soon as it is interested in the treat, give the command "leave it." Close your hand so the dog cannot get the treat. At first, most dogs will stick their nose in your hand and possibly nibble on your fingers or paw at your hand in an attempt to get to the treat. As soon as your dog stops trying and pulls away a little, offer praise (or click your clicker) and give it a treat. The treat you give your dog should be a different treat than the one you told it to leave. It's very important that you keep the treat covered at all times when you are in the beginning stages of training this command. If you accidentally allow your dog to get a treat before you give the click or praise, it will try even harder to get the treat next time. One or two mistakes will not make much of a difference. However, if your dog is getting the treat a few times during each training session, it is going to take much longer for them to understand what "leave it" means. Once your dog is consistently backing away from your hand, you can make things more difficult by increasing the time you make it wait for the treat. In the beginning, you should give the dog a treat the second it pulls back from your hand. You can slowly add a few seconds until you are able to go several minutes while your dog waits patiently for the treat. Next, you can begin to move the treat. Put it on the floor a foot or two away from your dog, but keep your hand close enough to cover it should your dog try to take it. Once your dog is consistently leaving the treat there, you can move it a little closer to them. After several training sessions, you can begin to step away from the treat yourself. A good way to begin this is to drop a treat on the floor while you're standing, and give the "leave it" command. Have a foot ready to cover the treat in case your dog makes a lunge towards it. Slowly increase your distance from the treat over several training sessions. Soon you'll be able to tell your dog to leave a treat on the floor when you are standing on the other side of the room. 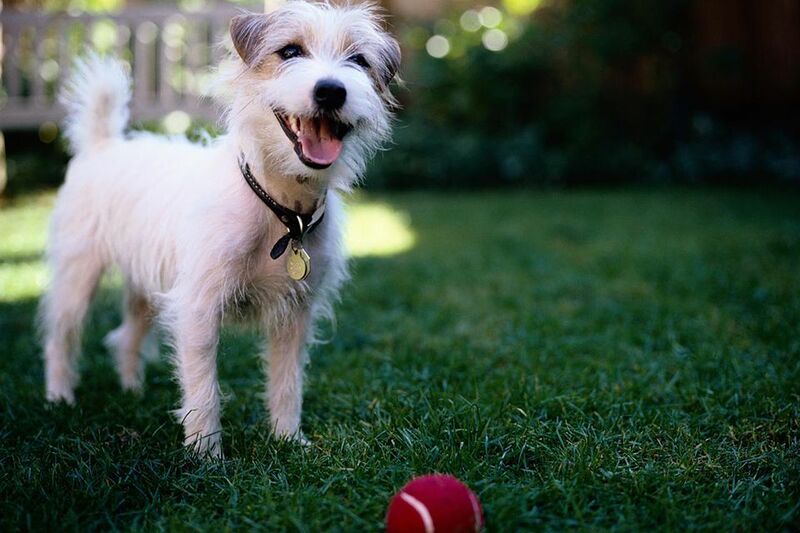 Once your dog has mastered "leave it" with treats, you can start practicing with other items. Put one of your dog's toys near it and say "leave it." As soon as the dog backs off the slightest bit, give it praise and a treat. Keep practicing with other items your dog enjoys as well. Before long your dog will learn to leave any item where it is whenever it hears the "leave it" command. This obedience command is all about teaching your dog self-control. After all, it's hard for dogs to resist some—okay, a lot—of things that are both good and bad for them. To really instill this level of discipline, you might find it beneficial to take a multi-pronged approach. While training the "leave it" command, make a point of doing other self-control training. These are simple things like making your dog work for food, playtime, or your attention, by having them sit or lie down first. Incorporating those into your daily interactions and doing small sessions on leave it every day can really develop this good behavior in your dog. How To Train Your Dog "Off"